This is my first carburetor car and I am still getting rid of the intake and exhaust leak from the rear cylinders with a gasket I ordered. My issue now is the car runs fine at idle, but the second you take it down the road and try to get it moving the carbs seems to run out of fuel inside the bowl. My 260z has a filter athe bottom of the tank to electric pump, up the body to the engine bay into large cannister filter to vacuum mechanical fuel pump to dual Weber carbs. The 3-5 psi required by carbs I easy for the newish pump under the car now. I am thinking that the mechanical fuel pump cannister in the engine bay of my 260z should be bypassed by the electrical pump I have near the gas tank. I believe the fuel delivery is my issue with a engine that can be running the suddenly die after burning a bit of gas with a longer rev. When I'm able to I'll try to see if I can pressure test the system and see if it's better to bypass. Greetings from Montana. This is my first post so let me know if it's helpful. So my '75 Z has been sitting in a garage since 2013 on account of the clutch pedal lost its pressure and the fuel system was all gunked up with rust. I went off to school so I had no time to work on it. I came home this summer and have been working on it for a month or so now when I can afford it and have the time and finally this weekend it should drive once again! I came to the conclusion that the priority would be the gas tank and fuel system. So I dove right into draining the gas and stripping the tank from the car. What I had found next was a nightmare. Layers upon layers of rust in the gas tank! First thing I did was sloshed around quite a few nuts and bolts with some old gas and banged on it very carefully with a hammer to break some of those rust chips up. I drained what I could of the broken rust pieces and began my search for a cheap alternative for a rust removing chemical. Come to find out, white vinegar works wonders if you submerge and soak rusted metal for a couple days. I got 17 gallons of the stuff for 2$ a gallon at costco because you will want to fill the entire tank to prevent flash rusting on exposed metal. I filled the tank and sealed it all off with duct tape except for the small tube at the very top of the tank so it could breathe the fumes. I let it soak for 3 days like this and I would suggest placing whatever you are going to drain the vinegar into underneath the drain plug BEFORE you fill it because you won't be able to lift it yourself after it is full of 17 gallons, unless you are Hulk Hogan. Once you are satisfied with the amount of time it has soaked(anywhere from 24 hours for minor rust to 3-4 days for caked on rust), unscrew the drain plug and commence draining. After all but about a gallon or so has drained, grab hold of the tank and start rocking it back and forth and 360 degrees, slowly to get all the flakes to drain. You could bang on it with a rubber mallet or hammer again as well. Once it's all drained, take your phone camera and put it on video with the flash on and poke it inside the sending unit hole. You will be amazed looking around at how well the vinegar works. You will see mostly bare metal. Unplug all the holes and allow it to dry for a day or so. I taped an air compressor blower to one of the holes to give it a blow dry for about an hour right after I drained the vinegar. There will be flash rusting and there is nothing you can do to avoid that unless you wipe it clean with a rag right after it has drained, which is impossible with a gas tank. But don't worry the next step will cover that. Now go to your local car parts store and ask for a liquid gas tank liner, any brand will do. Make sure you read the directions and get enough, especially if you want to do 2 coats. They usually come in 1 quart cans that will usually only cover about 12 gallons. The brand I got was this way. For my '75 280z the gas tank is 17.2 gallons so I had to get 2 quarts. Once you are satisfied that your tank has dried completely, it is time to put your first coat on. Look inside your tank and you will see that it has a divider to the skinny part of the tank. For this reason, I plug all the holes except for the sending unit hole on the tall part of the tank and the gas outlet hole on the narrow part of the tank. This allows you to fill both halves without worry of missing a spot with the coat. You need a good funnel for this stuff. Fill the narrow half with one quart first because it takes longer. Then fill the sending unit half with the remaining quart. Plug the remaining holes. Very slowly roll the gas tank around in your arms 360 degrees on all planes for about 15 minutes or until you think every spot has been touched by the good stuff. It's kinda like the consistency of molasses and it dries like a rubber glove so be thorough. After rocking it around on all planes I would let it sit on it's bottom for 5 minutes then on it's side for 5 minutes then on it's top for 5 minutes then on the other side for 5 minutes and back again on the bottom. I did this for an hour or so while I was changing the oil. I wanted to make sure that bare metal would not show. Once you are satisfied, place it on top of some saw horses or an old cooler or something and place one of the liner cans under the drain plug and unscrew it. Remove all plugs so it can dry evenly. On all the small openings, I took my air blower and blew a small amount of air through to make sure the liner didn't plug them. I would highly recommend this. Let it dry for a day. Come back and check to see if it dried evenly. If there are bare spots, do a second coat, if you have enough left over liner. I did anyway. Let it dry for a day and a half just to be safe. This next step isn't necessary but I recommend doing it since you already have the hunk of junk out. Get a can of rust proof spray enamel from your hardware or car parts store. You could get any color you want. I just got black cause I don't know what the paint job will be on the car yet. Tape all the holes, Air blow it free of debris and sand the rusty spots, air blow again, then commence spraying the enamel. Let it dry. Now that the gas tank is complete, check all your filters. My Z had a small filter between the outlet and the fuel pump. When I took it out, it was pack full of rust to the brim. I have looked all over the market and can not find a part to replace this filter. I tapped all of it out and submerged it in vinegar as well. There is a strainer between the fuel pump and the fuel line to the block. I removed that and soaked it in vinegar. I installed a new fuel pump while I had the gas tank out. And there is another larger fuel filter by the engine block under the hood. I just got a new one of those for 20$ and installed it. Once your tank is completely dry, put it all back together. I suppose you could seafoam the system and bleed it if you want to go a step farther. I probably won't since I know the gas tank is good and that is the source of bad gas. I figure any bad stuff that remains will get washed out and burned off in a day of driving. Thanks for reading my first post! Hope it helped! I was wondering if someone could tell me how to test my fuel pump relay with a multimeter? I was driving last night and my car started sputtering and running really lean and eventually just died. It would start and idle choppy until i pressed on the gas killing it. This morning when I went to go call a tow I noticed that it now only starts and immediately dies afterwards even with a jump. I'm experiencing a slight rich issue and need the groups help. Its an l28et running a JWT 550 kit in a 71 240z. Using the stock l28et fuel rail, Aeromotive FPR with psi gauge, upgraded to bigger fuel line (still using the oem return line), and an unknown in tank pump. Prior owner says its a 300zx turbo pump, but I have yet to drop the tank. I have seen it go to 65 psi with no pressure drop at all. 11.5 AFR until boost crosses the 10 psi mark, then fuel pressure shoots up 5 psi too much (relative to boost )and stays that way. At idle, fuel psi is correct. Cruising, it's correct. The problem shows up only after 10 psi of boost, thats when my AFR's go to 9.5-10.5. Myself and other can't see any smoke from the tail pipe during acceleration. I believe there is an restriction thats not allowing the fuel to return fast enough. Maybe the oem fuel rail? I don't see any pinches in the rail that would cause such a thing. Maybe its my setup. Any ideas where the restriction might be? I just bought a 1975 Datusn 280z and i drove it home. It ran well beside the exhaust leak that i will be attempting to fix in the future. I took off the front and rear bumpers first thing. I had to remove the gas tank to remove the rear bumper shocks. After reinstalling the tank, i put some gas in for a total of around 3 gallons. The engine took a while to start and ran kind of crappy so i thought it might need more fuel so i put 2.5 gallons more in. It started and idled fine so i figured it i would drive to gas station to fill up. less than a 1/4 mile from house it started cutting out on me. I started to turn around and it died a few times before I got it back home. I put 2.5 gallons more in the next day and it would idle fine for a long time but still cut out when i tried driving it once it got to higher rpm. I cleaned out the fuel filter and then it ran good for about 3 or 4 high rpm pulls before it started to cut out again. this time it started to idle kind of crappy too. Anyone have any advice? it never cuts out at high rpm when idling though, its just under load. Any help would be greatly appreciated. Guys, I'm still trying to get to my first drive after a long build. Last week I had an electrical issue that a few of you posted replies, and "rsicard" identified the issue. Thanks to everyone. So now electrical issues are behind me, I think. And I'm having a fuel delivery issue. The stock '77 280Z fuel pump is supposed to be good enough for TPI according to the JTR EFI book, but if I read between the lines I think it is marginal. No matter, my stock pump developed a slight leak between the halves of the fuel pump body, so a few weeks ago, I replaced it with a new 280Z pump "Airtex E8312" from Autozone. After getting the timing close (more work to do there later) it idles smoothly and pressure (measured at the shrader valve) stays between 35-40 PSI at idle. But as soon as I tip in the throttle, the pressure starts dropping until it dies at or below 25 PSI. Even if I try to go back to idle, once the pressure starts dropping, it can't seem to recover. No matter how careful I am, and I'm talking about barely 2000-2200 RPM, I seem to get fuel starvation. I talked to the parts house, and the Airtex E3210 is the replacement 5.7L Camaro pump, which is rated at the same max. pressure, 5 PSI less minimum pressure, but about 40% more flow rate. Flow rate sounds like my problem. However, the E3210 is an in-tank pump that won't physically mount like the external Datsun pump without modifications. I'd like to avoid all the mods to go in-tank if its possible. I didn't find anything in the FAQs, so what have you guys found as the best/right pump for this combination? Thanks, Steve And for those of you that keep requesting pictures, I will be posting them soon for anyone interested in this combination, my suspension mods, my Vintage Air AC install, or anything else of interest. Hello everyone, i had a question regarding the sr20det swap into the s30 chassis more specifically a 280z. What needs to be done so that the egnine can get enough fuel for about 250-300 crank horsepower reiably? Getting a fuel cell isnt really an option since i plan to daily this car in the future. I was just curious what everyone else was using in terms of fueling in their ka/sr swaps. Hi Everyone, I read many posts in the archives and lots of Google searches but I would love your advice on my specific case. I have a '78 unrestored 280Z that used to run like a charm and I'm not getting rough startup and probably heat problems? I am pretty noobish with mechanic (learning from 0) so bare with me. Symptoms: A vast majority of the time, the car will 'cough' a lot at startup and runs rough for about 5 to 10 seconds. I'm usually flooring it for a split second during ignition to avoid stalling and then gently rev til the engine runs smoother. I feel like the problem occurs more when the outside temperature is very hot (I live in SoCal), however my car is garaged and the problem also occurs in the morning. The car seems to run better warm and if I stop it after driving it for a couple mile and restart it in the next 10 minutes it will fire right away (like even faster than modern cars, I just push the starter and boom! When that happens I feel almost suspicious of how fast it starts). Finally, I had a problem 2 times. The car stalled after a few miles (usually hot day and driving a bit sporty). It stalls and doesn't turn back on. I had to push it to the side of the road and let it sit for 10-20 minutes before it'd start again. I changed sparks, fuel filter, ignition coil. Any advices appreciated. Stuff that I could check myself would be even better (keep in mind I'm a noob) Thanks a lot, M.
Working hard, but still have a flooding issue. Looking for advice. Hello all! I know this is a lot to read, but I am trying to be thorough and give as much info as possible. If you don’t want to read it all, you can skip to the last few sections and get the general idea of my current issue that I need help with. Thanks in advance! First, a little about me/the car: I have worked on cars for about 13 years now. I don’t consider myself a pro, but I consider myself fairly knowledgeable when it comes to cars. I have rebuild motors, help friends restore cars, done motor swaps, and do all my own maintenance. However, I know that every car is different and comes with its own unique issues/methods, so there is always something to learn. I bought a 76 280Z about a year ago and have been slowly fixing it up. This is my first Z so I knew it was going to be a learning experience (which is what I wanted) and so far I feel that I have done quite well with it. It was in pieces when I got it. The previous owner had blown the head gasket and had decided to take the opportunity to throw in a Chevy V8. He got as far as striping everything out of the engine bay and then decided he wasn’t interested. Luckily all the parts were there (albeit in many many boxes) so I decided to jump on it. I picked it up for cheap since it was an unassembled puzzle that needed some work. I decided to rebuild the stock L28 and put everything back in. I have completely dissassembled, cleaned, and powdercoated the suspension. There was a little rust in the usual places, but I have gone and cut out/fixed all of that. The interior was mostly bare and I have been working to fix it up. I will be posting up some pictures of the work before/afters of what has been done so far. This is in no way a full restoration project. The goal a solid project car that will be fairly reliable and I can drive every day if I want. I am trying to keep it a budget build so I have been doing all of the work myself (aside from machining the block and head). I am in the final stages of getting it back on the road, but have run into a big issue. Before I get into the issue, let it be known that I have had the FSM and FI Bible for it since day one and have been over them many times throughout the build. I have done searches on the forums but have only found one other post that had similar problems and so far, doing what that person did to fix the issue has not solved the issue on my car. I have tested just about everything I can using the FSM and FI Bible (and I will go into some more detail about that), but have been unable to solve my issue and I am ready to farm this out to the Z community for any suggestions and advice. The problem is as follows: When I first got the motor back in and everything hooked up, it would start fine and idle decently, but had a bad misfire under acceleration and once warmed up real good, would occasionally sputter and die at idle. The severity of the rough idle/acceleration seemed to vary quite a bit over the coming weeks trying to diagnose and fix the issue. I adjusted the ignition timing and it seemed to help a little but it did not completely solve the issue. I installed a fuel pressure gauge in line (was planning on doing that anyways) and it shows normal pressure as described in the FSM. I pulled the plugs (which are new) and they were covered in soot, so I know that it was running very rich. I figured that it could be sticky injectors (the only thing aside from the pump that I didn’t change in the fuel system) so I went ahead and swapped them all out. I was able to get a new set of Bosch injectors on a closeout price so it wasn’t a big expense and probably would have needed to be done anyways since the car sat for over a year. Still ran rough. In the past month or so (I have a very busy schedule during the summer so progress has been a bit slow) I have accumulated only a few miles from taking it up and down the driveway and around the block once to test out whatever adjustments I made. Currently the car will not start (yeah I know, you’ve heard it many times before in the “my car wont start please help me!! !” posts). It all started when I last took it down the road for a test and then after the motor was good and warmed up I turned it off. When I went to crank it up again after about 2 minutes it started briefly for about 5 seconds and then died. I cranked it again to try to start it and would get nothing. I popped the hood to have a look and saw fluid pouring out from near the radiator. I thought “crap, busted the coolant system”. 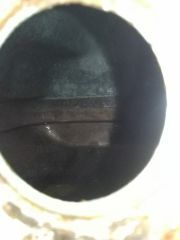 I go forward to have a look and realize that it is fuel pouring out of the intake filter. You can imagine my alarm when I realize I have a ton of gas pouring out of a hot engine! I let the car cool down and started the process of evacuating the fuel out of the cylinders/intake. The car will no longer start at all, it will just immediately flood. On to what I have done to try to fix the current flooding issue: I searched the forums for stuff like “fuel coming out of the air filter” and was only able to find one really closely similar post, found here: http://www.classiczcars.com/topic/43951-1978-280z-fuel-pouring-from-throttle-body/ Reading through this lead me to the common “bad CSV” issue. I have since blocked off the CSV entirely and yet it still floods. I have hooked up a set of noid lights and cranked the motor (with fuel pump unplugged of course) to test that the injectors were getting a pulse from the ECU instead of being stuck on, and they were all fine. I tested the AFM directly with a multimeter and it checks out. I tested the main connector to the ECU and everything checked out within the specs lain out in the FI Bible with one possible exception. The page for “Air Flow Meter Fuel Pump Contacts” (page 53, Test #1-(5)). It says when the AFM flap is at rest there should be no continuity, and that when it is open there should be continuity. What it doesn’t say is whether or not this test should be done with the key off, or in the on position (some test state to have the ignition in the on position, while others do not). When I run this test with the key off, it checks out fine. But when I run the test with the key in the on position, I get continuity all the time regardless of flap position. If I understand the system correctly, this circuit is what keeps the fuel pump running when the engine is running, and shuts it off when the engine stops running. So to me, I would think that this test should still have no continuity with the flap at rest and the key in the on position. Is this correct? If so, I feel that it might be that the AFM is bad, but when I test the AFM directly with the multimeter, it seems fine. I just don’t want to start replacing very expensive items to diagnose. Clearly something has changed after the first time it flooded out because that is all it will do now. I was thinking maybe the first time it flooded, gas got into either the AFM or TPS or something, and is causing a short or false signal and telling the ECU to pulse longer than it should, or pulse at the wrong time. I opened up the ECU and it looks perfect (no bulging components, no burns, clean as a whistle). Since the last time it flooded, I have dried everything out and completely disassembled and cleaned the BCDD (which was full of fuel). I did a compression test again and so far it looks like no mechanical damage has been done as a result of flooding the motor a few times. I cant find anything wrong (and it could be that I am missing something), but I am reluctant to keep trying to start it because of the clear risk of causing mechanical damage if it keeps flooding. Sorry again for the extremely long post, and thank you very much if you took the time to read through it all and reply. I tried to be thorough, but in my long post may have left something out. If so, I apologize and will add info as requested. Any help or suggestions would be greatly appreciated! TO RECAP: The engine used to run, but misfired and was running very rich. One day it flooded out to the point of fuel dumping out of the intake and now that is all it will do. I have tested the AFM and ECU harness and as far as I can tell it all seems to be pretty good. Parts that are new are the injectors, ignition coil, plugs, FPR, fuel filter. I get spark, and fuel pressure is good. I have blocked off the CSV entirely, so it is safe to say that it isn’t what is dumping fuel into the intake. ECU looks good and I have tested each injector plug with a noid light and am getting a pulse. It could still be that the ECU is sending a longer pulse than it should, but I don’t have an extra ECU around to see if there is a difference. Hey guys, I was searching the internet far and wide trying to find a figure for dead times on my injectors and I found a cool website that other people will probably find useful. http://injector-rehab.com/shop/lag.html These are probably not going to be exactly the same as your injectors, so if you're feeling adventurous you can measure your actual individual injector dead times using this page here: http://www.msextra.com/doc/ms3/injdeadtime.html Hope this helps somebody. Hello everyone, I recently took the engine out of my 280ZX to repaint the engine bay and replace some parts on the engine. I have the engine placed back in the car and the starter is working. It sounds like it wants to start when I put starter fluid in throttle body and I am getting fuel pressure before the pressure regulator on the fuel rail. I am not getting any fuel pressure on the other side though. Is there anything I can do or do I have to just replace the regulator. No fuel 72 240Z, HELP! Started to get a loss of fuel stall at high rpm with full throttle 3 weeks ago and assumed mechanical pump was going bad. I've been out of country for 2 weeks so when I returned I replace the fuel pump and get no fire at all. There is at least 3 gal in the tank and I have cleared all the lines but when I crank it over there's no fuel flowing into the filter and when I pulled the fuel line from the carb and crank I get no fuel as well. Grabbed the old pump and she work just fine by hand pump as well??? Why can't I pull fuel from the tank? Is it possible the cam lobe to actuate the pump lever is screwed up? Wouldn't that have been more catastrophic? I'm at a total loss. I could run the electric pump with mechanical omit but I'm not convinced that's the right choice until I know why I can't pull or push fuel. Any thoughts?